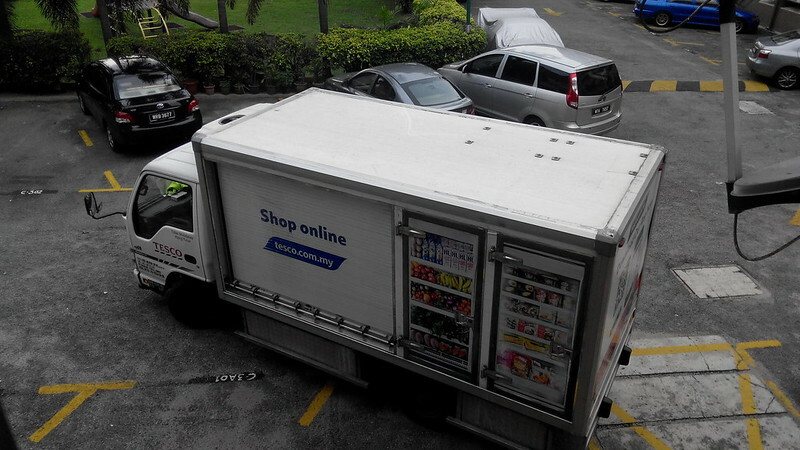 A Tesco truck pulling up in front of my apartment block. Hi guys, today I'm going to rave about Tesco's home delivery service. I've ordered groceries from them at least 10 times now and so far, I'm really happy with the service. There are so many benefits to grocery shopping online that I highly recommend it. 11. It'll save you money, as there are no impulse buys. Now that I've been ordering our groceries online, we don't have to spend time dragging the kids around a hypermart. Instead, we're able to be more leisurely on trips to the mall. We have lunch or dinner, do a bit of window shopping, and that's it. 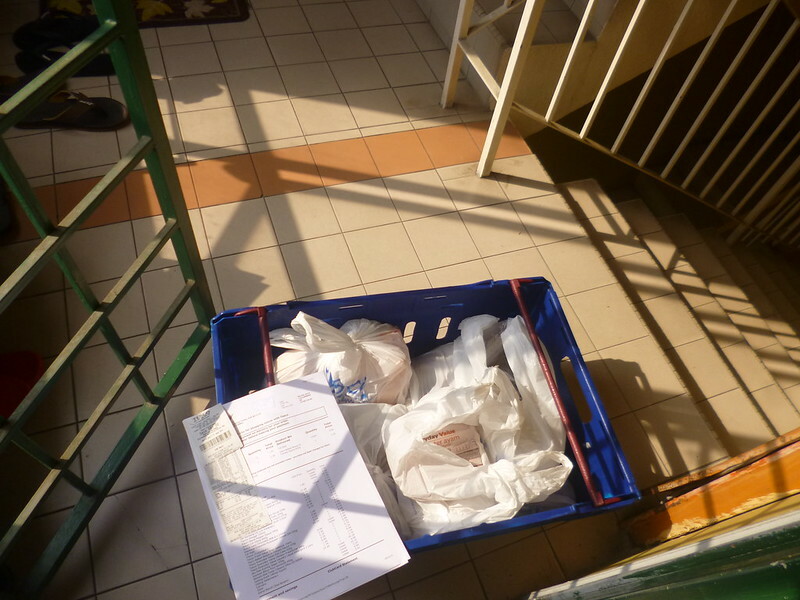 Groceries delivered right to my doorstep! Gotta love it! But are there any cons to online grocery shopping? How about freshness? What if something's not in stock? These are the questions I frequently get asked. And my answer is, the pros totally outweigh the cons. The only con I can actually think of is, sometimes things aren't in stock. For dry goods, they'll bring you a replacement, which you can choose to accept or reject. I once accepted a replacement for orange cordial and it was a brand I would never buy... and it tasted awful! Lesson learnt. However, for fresh groceries, they don't bring replacements. A few times I ordered some fish, and they didn't have them. So if you're ordering fish for dinner that night, be sure to have a back up order or plan. As for freshness, it's never been an issue for me. You see, the people who pick the groceries for you at Tesco's are specially trained, so it's as good as (or even better than) picking things out for yourself. I would recommend this service to anyone, but I think it's especially useful for the elderly, people with disabilities, busy stay home mums taking care of the kids and those who work from home. terimakasih lin for the info. biasa lin oder barang kering atau basah. berapa minimum sekali oder ye. nmpk mcm senang jer kan..
Hi Kak Yon, thanks for your comment :) Lin order kedua-dua barang kering dan basah. Ayam, ikan dan udang semua Lin order. Kualitinye bagus dan segar. Takde minimum order tak silap Lin. Memang senang kak!